The Eclipse JDT model includes the classpath container concept. A classpath container is a logicalcollection of Java libraries, i.e., JAR and ZIP files, that canappear on a project’s classpath. MyEclipse provides you with many user-configurable classpath containers, including Generic JavaEE Libraries and many framework libraries, like JSF, JPA, Spring,Struts, etc. Note: Runtime libraries are not deployed with your project. 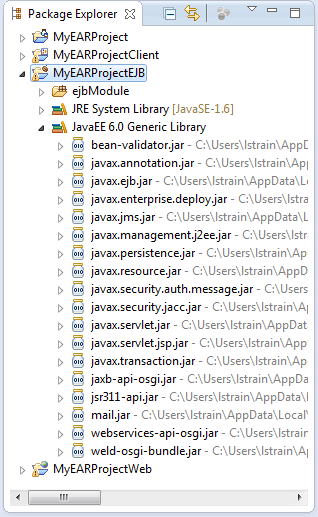 The figure below depicts contents of a Java EE 6 runtime library. 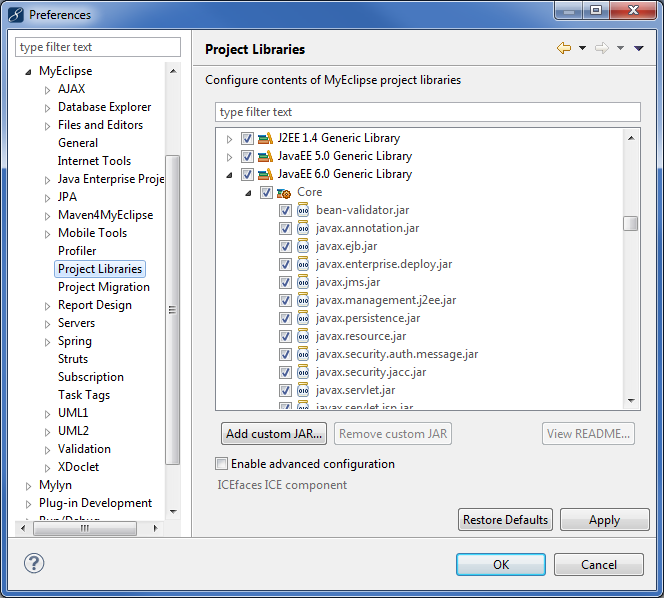 Open the project Libraries preference page by selecting Windows>Preferences from the menu, expanding MyEclipse, and selecting Project Libraries. Select the library to modify, and use the Add or Remove Custom JAR buttons to edit the contents as needed.